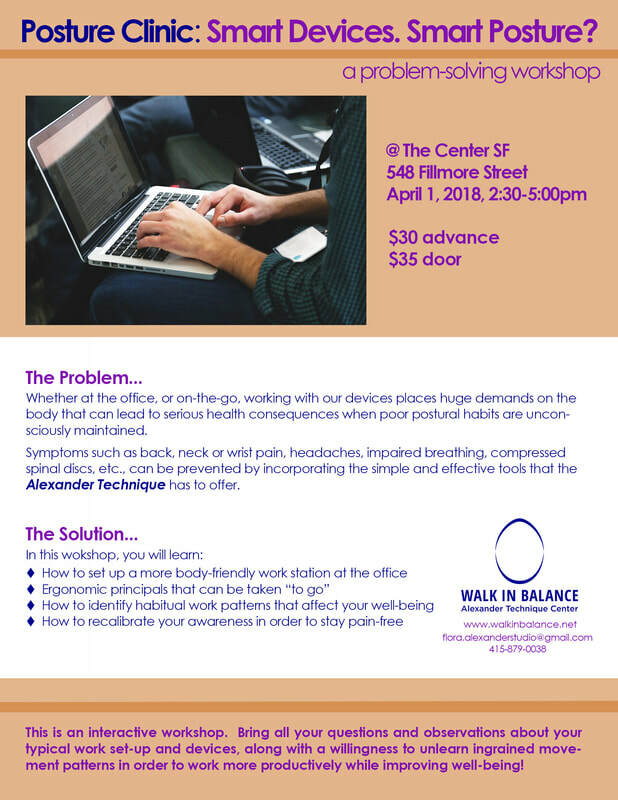 [FREE Monthly Posture Talk and Demonstration] New Dates: 4/28 and 6/2 from 4:15-5:30pm @ Walk In Balance Alexander Technique Center, 870 Market Street, SF (limited to 4 people). This free introductory talk is for anyone who would like to be introduced to the Alexander Technique teachings. Please sign up in advance here. Tai Chi is a wonderfully calming and stress-reducing activity, naturally counteracting our fast-past, modern life-styles. When you learn and practice Tai Chi, the benefits are multifold. Besides cultivating internal power and a more easy-going attitude, benefits of a regular Tai Chi practice include better posture and flexible joints, balance and co-ordination, relaxation, clarity of mind, reduced stress and improved body tone. Your internal structural system gets a tune-up and reset each time you practice, which can prevent injury and pain associated with a sedentary life, too much stress and computer overuse. Alexander's principles of effortless power, self-cultivation and grace in movement are the cornerstone of this unique and mindful way of learning Tai﻿ ﻿﻿C﻿hi. Even though functional alignment and precision are emphasized as important keys to a successful and long-lived practice, we are not necessarily concerned with how flexible you are, but rather how to bring ease and fluidity to your movements. ﻿[FREE Monthly Posture Talk and Demonstration] New Dates: 3/16 and 4/21 from 4:15-5:30pm @ Walk In Balance Alexander Technique Center, 870 Market Street, SF (limited to 4 people). This free introductory talk is for anyone who would like to be introduced to the Alexander Technique teachings. Please sign up in advance here. ﻿[Worksho﻿p] "Active Rest: A Powerful Practice for Tension Relief. Saturday, 4/13, 2019, 3:30-5pm, $34 @ Walk In Balance Alexander Technique Center, 870 Market Street, SF. (Please sign up by Thursday, 4/11) De-compress and open up to the experience of ease in mind and body by lying on your back! Your body is always supported by the surfaces it contacts, but most of the time we are not aware of the fact that we can fully trust that support - hence our muscles tend to be in a constant state of tension in response to daily stress. ​"Active Rest" Practice is a wonderful relaxing and highly effective self-help tool based on the Alexander Technique. It only takes 10-15 minutes to practice. It's suitable for anyone interested in deep tension relief due to physical stresses caused by hunching over desks, laptops and cellphones. You will be able to enjoy and use what you have learned right away. All you need is a comfortable place to lie down on a floor or mat, the luxurious thought that you will do absolutely nothing for a few minutes (you will see what I mean! ), and then get up and be relaxed and refreshed to tackle the next part of your day, feeling fully renewed. ﻿[Worksho﻿p] "Active Rest: A Powerful Practice for Tension Relief. Sunday, 3/3, 2019, 2-3:30pm, $34 @ Walk In Balance Alexander Technique Center, 870 Market Street, SF. (last sign up Friday, 3/1) De-compress and open up to the experience of ease and calm in mind and body by lying on your back! Your body is always supported by the surfaces it contacts, but most of the time we are not aware of the fact that we can fully trust that support - hence our muscles tend to be in a constant state of tension in response to daily stress. [Workshop] "﻿Te﻿nsio﻿n: A System﻿-wide Issue" November 12 and 13, 7-9pm @ Sivananda Yoga Vedanta Center, 1185 Vicente St. and 23rd Ave, SF. Tension, stiffness and slouching are not local physical problems, but always system-wide issues. Basic and long-lived patterns of habit often interfere with enjoyment and progress in your practice. Explore the relationship between everyday habits of movement and habits on the mat. Read more. 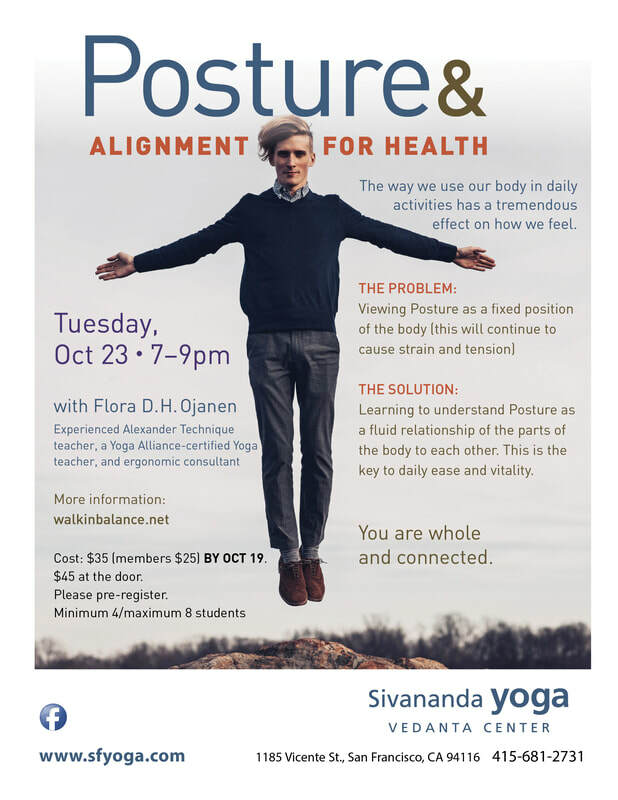 [Workshop] "﻿Posture & Alignment for Health, October 23, 7-9pm @ Sivananda Yoga Vedanta Center, 1185 Vicente St. and 23rd Ave, SF. The way we use our body in daily activities has a tremendous effect on how we feel. Understanding and changing the habits that prime us for repetitive strain is the often overlooked and missing link to our health and vitality - and the focus of this workshop. Read more. [Workshop] "Sitting, Standing and Walking with Ease", Sunday, September 23, 2:30-4:30pm, $34 @Walk In Balance Alexander Technique Center, 870 Market Street, SF. (last sign up Friday, September 21) If you are like most people, upright sitting can be difficult to maintain if your back hurts and your body tends to feels heavy and uncoordinated. [Workshop] "﻿Te﻿nsio﻿n: A System﻿-wide Issue" Monday, June 25 and Tuesday, June 26, 7-9pm @Sivananda Yoga Vedanta Center, 1185 Vicente St. and 23rd Ave, SF. Tension, stiffness and slouching are not local physical problems, but always system-wide issues. Basic and long-lived patterns of habit often interfere with enjoyment and progress in your practice. Explore the relationship between everyday habits of movement and habits on the mat. Read more. ​7-9pm, $55/$65 @ Sivananda Vedanta Yoga Center, 1185 Vicente St. and 23rd Ave, SF. If bending, twisting and flexing our spine in Yoga is done with integrity and alignment, the spine will become stronger and more supple. But unfortunately, the same unconscious habits we employ in daily life also shop up in Yoga practice, such as rounded backs, shortened spines and tense necks. 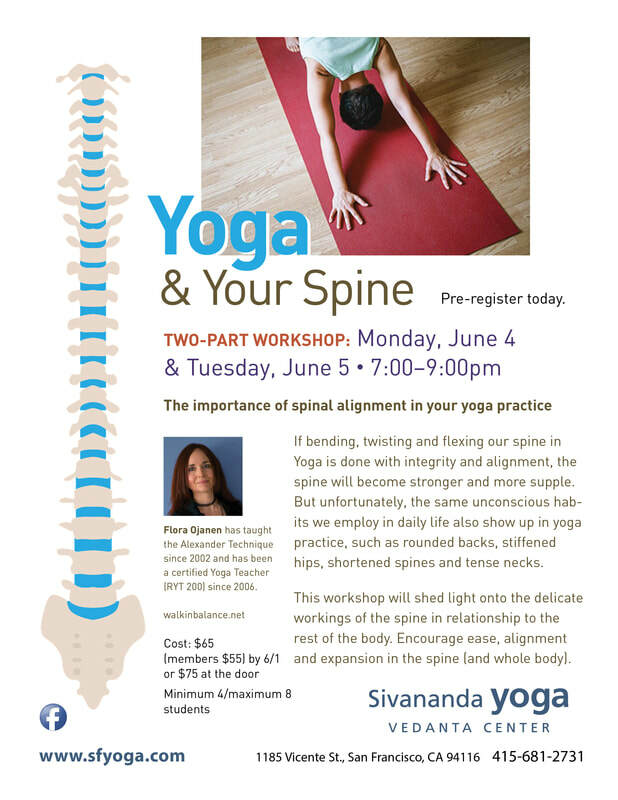 This workshop will shed light onto the delicate workings of the spine in relationship to the rest of the body. Encourage new ease, alignment and expansion in your spine! [Workshop] POSTURE CLINIC: SMART DEVICES. SMART POSTURE? ​A problem-solving workshop. Saturday, April 28, 4-6pm, $34​ ​@ Walk In Balance Alexander Technique Center, 870 Market Street, SF. (last sign up Thursday, April 26) Whether at the traditional office, or on-the-go, working with our devices while maintaining poor postural habits places huge demands on the body and will over time lead to serious health consequences. ​​@ Walk In Balance Alexander Technique Center, 870 Market Street, SF. (last sign up Friday, March 9) Are you suffering from chronic upper body strain, RSI injuries, joint problems or frequent headaches? Is the pain amplified when using phones and laptops? ​There are many sources for exercises and ergonomically improved chairs or office desks (hello, standing desk! ), but what most people overlook is the one and most important factor that makes or breaks any effort to get out of pain: The way you are using your body at the office. 'Text Neck' is a modern disease which is negatively affecting all systems of the human body, starting with the neck, back, arms and entire spine. [Workshop] "Sitting, Standing and Walking with Ease", Sunday, March 25, 3-5pm, $48 @Walk In Balance Alexander Technique Center, 870 Market Street, SF. (last sign up Friday, March 23) If you are like most people, upright sitting can be difficult to maintain if your back hurts and your body tends to feels heavy and uncoordinated. @Sivananda Yoga Vedanta Center, 1185 Vicente St. and 23rd Ave, SF. We all know the importance of right posture in meditation. The unfortunate response to our efforts to "have good posture" in meditation is usually added stiffness in our necks, backs, shoulder, or hips. Come and learn how "having good posture" does not work, but "being in good alignment" does. This hands-on workshop is suitable for beginning and advanced meditation practitioners. [Workshop] "Yoga and Your Spine", Monday, March 26 and Tuesday, March 27, 7-9pm, $55/$65 @ Sivananda Vedanta Yoga Center, 1185 Vicente St. and 23rd Ave, SF. If bending, twisting and flexing our spine in Yoga is done with integrity and alignment, the spine will become stronger and more supple. But unfortunately, the same unconscious habits we employ in daily life also shop up in Yoga practice, such as rounded backs, shortened spines and tense necks.